Without using a plugin, the best method for user-defined ordering of pages and entries is to sort by authored_on date. The authored_on date for entries can easily be updated using the “batch edit” functionality in the “More actions…” menu on the Manage Entries listing screen. Because pages are listed by modified_on the “batch edit” functionality also uses the modified_on date. This is bad because the next time the page is saved, the modified date will be updated. (I submitted a bug about this some time ago.). So follow along as we make a few changes to two Movable Type application templates to update Manage Pages screen (and the batch edit functionality for pages) use the authored_on date instead of the modified_on date. Note: We could just update the batch edit mode to use the authored_on date, but it would be more useful to update the Manage Pages screen to also use the authored_on date so that pages will be listed in the same order they will appear in the templates. These steps were tested in versions MT4.32 and MT4.261 but will work for all versions of MT4.x and MT5.0 as well. Once these edits have been made, login to Movable Type and view the Manage Pages screen. All pages will be listed by created_on date. Previously, I wrote about how to add Edit Links to Entry and Page templates. This guide uses the mt_user cookie set when logging into Movable Type to condition content (links to screens in MT) on entries and pages published by Movable Type. Also provides an option to use a non-MT cookie to do the same thing. Continue reading Edit Entry & Page Links in Movable Type. I needed a flexible system to append crumbs to an array… potentially remove items from the array, then output the array on the final template as a breadcrumb navigation. This was my solution using Movable Type template tags. I used the Var function attribute to push, shift, unshift items on an array variable and then used mt:loop to output the items in the array into a list of breadcrumbs. This was used in a Movable Type install with 20 blogs. On an Entry Listing archive template for a blog with Monthly archives enabled, add crumb for Archive Index page and for the current page. With large volumes of code… sometimes it’s useful to place comments in the code to document what the code does. In html, developers often use a html comment on a closing div tag to note which tag is being closed. Once the page is being published in the production environment, these comments are no longer necessary and just add to the weight of the file. Create a Global Config template module and then set a variable in that template. Include this template module in all your templates and use the value to condition code. Use configuration directives in your template. There are a bunch of useful Configuration Directives for Movable Type. Use the value of config directives in your templates as conditionals. Hope either of these may be useful. Requires dirify function and dirify_table. I like to use ampersands in my titles because they look spiffy, so I added ampersands to the dirify_table such that “&” is now dirified to “and”. Sometimes you want dashes instead of underscores. This dirify function takes a second parameter that is the default separator. Stumbled across another way to Add Custom Styles for a Single Entry in Movable Type from the entry Individual Style on Khoi Vinh’s Subtraction.com. This is great if there are many rules to add and/or if there is a need to edit the css independently from the publishing of the entry. For just a few simple rules I’d still add the rules inline. This has the benefit of keeping the styles directly associated to the content being styled. 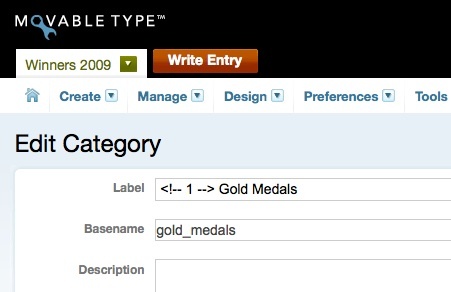 Add an edit links to your Movable Type entries and pages. Continue reading Edit Links for Entry and Pages. This guide will take you through the steps to install the necessary software to turn your Mac into a server with the required software to run Movable Type and then walk you though installing Movable Type. internet connection …well I guess you have one if you’re reading this! Terminal.app - find this in your Utilities folder (from the Finder: Go > Utilities). You should be comfortable using the command line when proceeding with the following steps. Installing these 8 software libraries takes about 45 minutes. As I completed the step, I noted the running time. Double-click “XcodeTools” from the DVD that came with your mac. After installing MySQL.prefPane, the preference pane will be displayed. Click the Start MySQL Server button and be sure the checkbox for Automatically Start MySQL Server on Startup is checked. Install the below modules via Terminal app. Each may take a few minutes to install. If installation seems to stall but you get no errors, then assume all is going well. If necessary, go make a sandwich and come back a little while later. enter the admin user password when prompted: type the password and hit “return”. manual configuration: type “n” and hit “return” to use default configuration. optional modules: type “n” and hit “return” to not install these. mandatory modules: type “y” and hit “return” to install these. select the default option when otherwise prompted: hit “return”. We’ll check to ensure all these modules are installed correctly using the mt-check.cgi script after installing Movable Type. We’ll install three image libraries and then ImageMagic itself. There are three prerequisite libraries for the version of ImageMagick we’ll be installing. The below steps assume that you’re downloading files to the “Downloads” in the user’s home directory; modify the installation commands as necessary if your browser downloads the files to other locations. Go the the libpng site: http://www.libpng.org/pub/png/libpng.html. Scroll to the “Source code” section and click the “.tar.gz” link under “with config script” heading. # Include custom apache configuration from live site directory. Not all of this config file is crucial, but it’s all useful! Alias the user apache config file into the directory which the main apache config includes other config files. The main apache config file (located here: /private/etc/apache2/httpd.conf) contains the line Include /private/etc/apache2/other/*.conf which will include all file ending in “.conf” which are placed in the /private/etc/apache2/other/ directory. Filenames may be different if using different version of Movable Type. Create symlink aliasing mt to the current version of MT. Note: Instead of using movabletype you may want to create one database per version of Movable Type or per project/site. Set permissions on the database. Note: this command uses no username or password. This can make installation simper on a local machine, however it is recommended that a password be used on any shared machine. If mt-check.cgi shows that various modules are not installed, attempt to re-install using the steps above. Access this URL and follow the steps to create your first blog.